FARGO, N.D. - Stevie Famulari has brought a bit of Central Park to North Dakota. 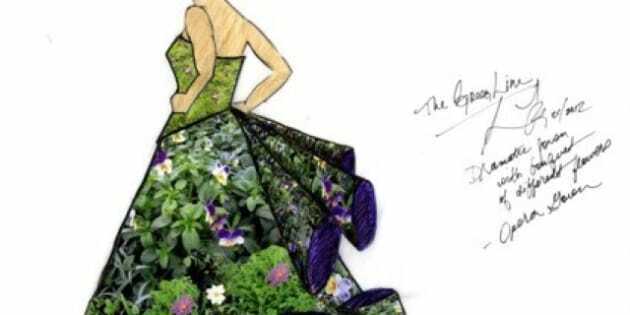 The 40-year-old Famulari, a native New Yorker who moved to Fargo five years ago, has created five park-inspired dresses out of living plants that grow, flower and reseed themselves. One of the pieces, an opera gown, has already died once and grown back. Each dress contains more than 5,000 living blossoms. The creations are more art than attire, though Famulari lined each one with a waterproof material that allows them to be worn and, after trying them on, declared the wearable bearable. "It is not like I got super comfortable, but I have worn less-comfortable dresses," she said. Famulari's work is entitled "The Green Line Project: Garden Parties." She created an opera gown, an asymmetrical gown, a lawn coat, a wedding gown and a lace gown. The collection is on display through the end of the month at Fargo's Plains Arts Museum. "I'm the first living piece in that museum," said Famulari, whose other titles include pastry chef, doctoral student and landscape architecture professor. But this isn't her first project to challenge the senses. She fashioned a dress out of chocolate that was a regular at several New York chocolate conventions and earned her appearances on the talk-show circuit, including Oprah. Famulari also frequently appears on the "Food Network Challenge" show, where one of her cakes had to be hosed down with a fire extinguisher. She laughed when asked if there was any trial and error before she decided to move forward with the Green Line Project. "Those Food Network Challenges are indicative of my personality. I don't do test runs. I don't pre-practice," she said. "I'm intelligent, I'm versatile, I'm flexible, and, frankly, it would ruin the spontaneity of this." Famulari formulated the park-turned-dress idea about three years ago, as she began pondering how renowned landscapes, such as Central Park or Versailles, would look on dresses. Her plan to combine science, art and fashion was advanced, oddly enough, by a group of three dozen landscape engineers — or "flannel-wearing guys who spray roads," she said. They were researching how to make seeds to grow on a vertical surface without falling off. She first bounced the idea off Dan Larsen, a geotextile and erosion control expert for Brock White, a St. Paul, Minn.-based construction supply company and one of the Green Line project sponsors. He had given guest lectures to Famulari's landscape architecture students at North Dakota State University. "It's the most unique thing that I have seen in forever," Larsen said. "Nobody was quite sure where it would go, but we knew we didn't want to be on the sidelines." Their brainstorming session resulted in a felt-like fabric that creates its own ecosystem — it holds the seed and stays moist, but it's not so wet that it kills the root. The fabric requires plants with a shallow-root system that will bloom with the same set of nutrients, some of which "make steroids look tame," Famulari said. And it had to look good on the human body. The opera gown was the first to be planted, and blooms with poppies, daisies, violets, zinnias and baby sprouts. Although Famulari makes regular visits to a hothouse to nurture her sartorial plants, she said the complicated project is indebted to the staff of Shotwell Floral, a longtime Fargo flower shop. J.D. Shotwell, a company vice-president and fifth-generation florist, said the biggest challenge is finding the proper nutrients for plants that have no soil. They are watered two to three times a day, he said. "To tell you the truth, it has been a learning process for us, too," Shotwell said. Kimberly Schultz is one of Famulari's first and best friends in Fargo. A Boston native, Schultz is a stylist who works on wigs and makeup for opera performers. She dolled up the models— ranging from a 25-year-old Miss North Dakota runner-up to a 73-year-old retired college professor — for the project's photo shoot. Schultz is partial to the floral opera gown, but said the lawn coat has promise. "You see fashion coats that have the fur that look just like the lawn coat. Plus, it smells good," Schultz said. Schultz said Famulari likes to push artistic boundaries and make people think. "People keep asking what it's for," Schultz said. "It isn't for anything. It's for art."